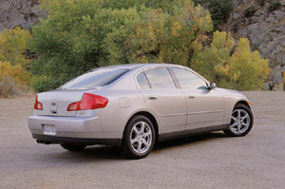 The Skyline finally made its long-awaited US debut for Nissan's luxury-brand Infiniti in spring 2002 as a 2003 model. 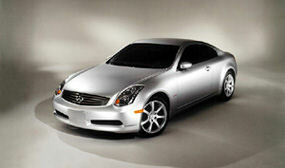 The Infiniti G35 came powered by the 350GT's 3.5-liter V6, which in the US initially produced 260 hp. Both a 6-speed manual and a 5-speed automatic were available. The Infiniti G35 received several acclaims in the US, including MotorTrend's Car of the Year in 2003 and a three time listing on Car and Driver's 10Best list. An exciting Sport Coupe featuring a slightly stronger engine rated at 280 hp was introduced half a year after the launch of the sedan. Based on the V35 Nissan Skyline and sharing its underpinnings with the Nissan 350Z, the Infiniti G35 marks the first step for Nissan Skyline onto American ground. The Infiniti G35 sedan is based on Nissan's FM-platform which places the front-mounted 3.5-liter V6 behind the front axle for better weight-distribution. In addition to sporty handling and ample power from its 280hp engine, the G35 also provides a spacious interior a good ride, thanks to its long wheelbase.